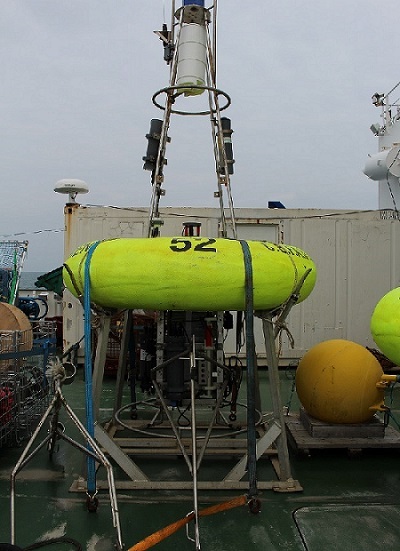 Wednesday saw the deployment of two moored instrument suites owned by Cefas. The first deployment was a lander similar to the NOC-L (National Oceanography Centre, Liverpool) Mini-STABLE lander deployed earlier in the cruise, although the instruments attached to the Cefas minilander are very different. The Cefas lander has an ADCP (Acoustic Doppler Current Profiler), which uses the Doppler affect to measure current speed and direction through the water column. As well as the ADCP there is a water sampler collecting a sample of water in a plastic bag (to be analysed for nutrients on land after the mooring is retrieved) and other instruments measuring a variety of parameters including temperature, chlorophyll fluorescence and optical backscatter (a way of measuring how many particles are in the water, which is useful for determining how much sediment any storm events may mix into the water column). The second one was a Cefas SmartBuoy which was deployed at the same location as the lander but instead of resting on the seabed it floats on the surface. The SmartBuoy has all the same instruments that are on the lander as well as a water sampler which will collect one sample of water each day for analysis back at the lab. The Lander and the SmartBuoy are useful because they can provide long term high resolution background data. The overall UK SSB programme is a seasonal project, lasting one year, and repeatedly sampling the same sites to see how the processes affecting the carbon and nitrogen cycles vary between the seasons. The seasonal changes in the Celtic Sea primarily revolve around the development of water column temperature stratification in spring, through to when it breaks down in late summer to early autumn (see the previous blog post for an explanation to this process and the resulting phytoplankton blooms). The data collected by the SmartBuoy and minilander provide very useful data on the timing and magnitude of the development of stratification and the phytoplankton blooms. 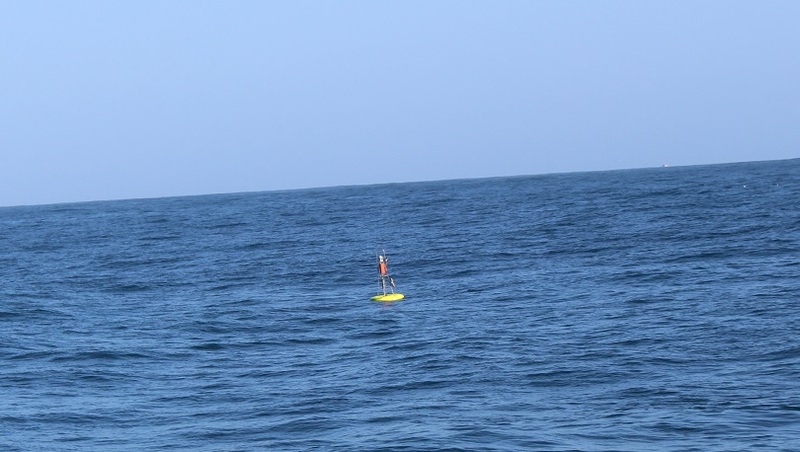 The chlorophyll fluorescence and oxygen sensors attached to the SmartBuoy on the sea surface can detect the start of the phytoplankton bloom as phytoplankton use chlorophyll to photosynthesise, a process which produces oxygen as a by-product. Meanwhile on the seabed, when stratification develops there will be a decrease in oxygen. This is because aerobic bacteria and the countless other marine organisms which require oxygen will continue to use it, however, as this layer has now been cut off from the surface (by the thermocline) the oxygen diffusing into the surface water from the atmosphere does not make it down to the water below the thermocline quick enough to replenish it. This decrease in oxygen will be picked up by the oxygen sensor attached to the Cefas minilander. 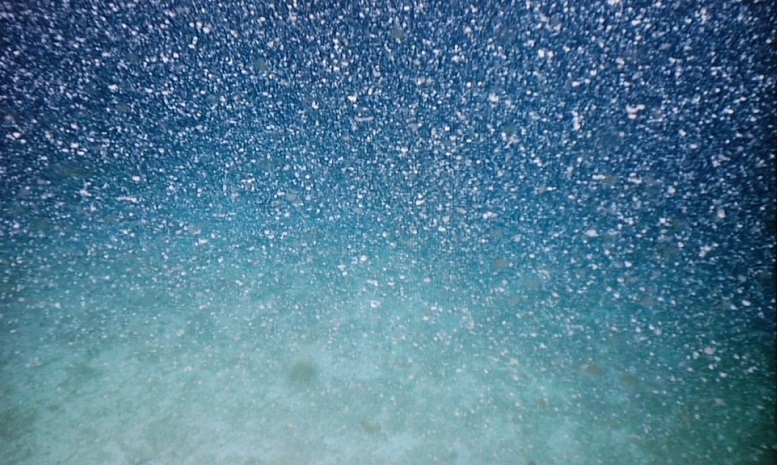 The minilander is also able to detect when the phytoplankton bloom dies off, as the large influx of dead phytoplankton cells falling down through the water column (also known as Marine Snow) will cause a peak in chlorophyll and later a further decrease in oxygen, as the phytoplankton are consumed. By measuring the biogeochemical changes which revolve around the development and breakdown of stratification, the data from the Cefas minilander and SmartBuoy can help put the rest of the data collected during SSB into context, by placing the measurements taken during this cruise within the seasonal cycle that this region experiences.